"If you stay curious, then you can see the world however you want." 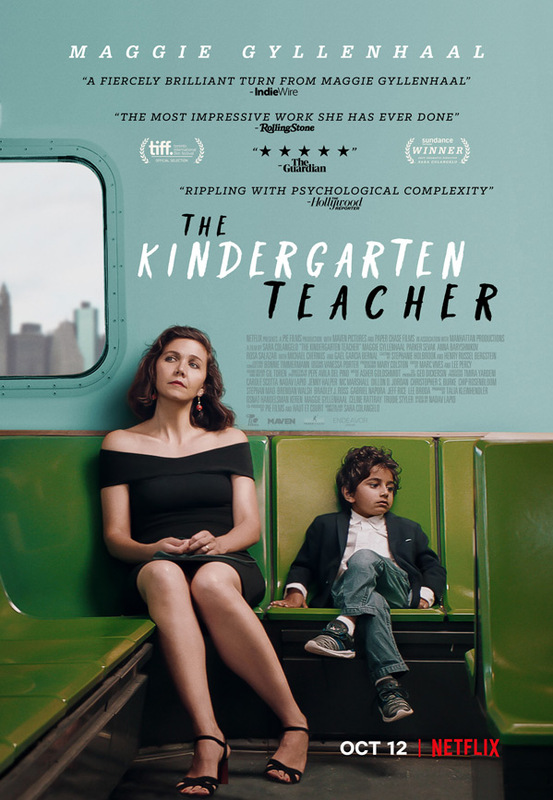 Netflix has unveiled an official trailer for an indie drama titled The Kindergarten Teacher, which premiered at the Sundance Film Festival earlier this year. It won the U.S. Dramatic Directing Award at Sundance, and will play at the Toronto Film Festival next month. Described as a "tense psychological thriller", this film is actually a remake of an Israeli film also titled The Kindergarten Teacher. The story follows a teacher who gets obsessed with figuring out how to support and accentuate a gifted young boy who recites poems out of nowhere. Maggie Gyllenhaal stars, with Parker Sevak as the boy, plus Anna Baryshnikov, Rosa Salazar, Michael Chernus, and Gael Garcia Bernal. This is a very compelling, thought-provoking film with some strong performances, and it played to great reviews at Sundance. I really hope it finds an audience and begins many discussions. Lisa Spinelli (Maggie Gyllenhaal) is a kindergarten teacher in Staten Island who yearns to live a life of art and intellectualism. She takes an evening poetry class but, despite her best efforts, her work is mediocre. When she overhears Jimmy (Parker Sevak), one of her five-year-old students, reciting an original poem in her classroom, she is floored. Convinced he is the equivalent of a young Mozart, she becomes obsessed with the child and embarks on a dangerous journey to nurture his talent. As Lisa continues down this increasingly desperate path, she seems ready to throw away everything to chase an impossible dream. The Kindergarten Teacher is both written and directed by filmmaker Sara Colangelo, director of the film Little Accidents previously. It's a remake of Nadav Lapid's film of the same name from 2014. This first premiered at the Sundance Film Festival earlier this year, and will also play at TIFF next. Netflix will release The Kindergarten Teacher in select US theaters + streaming starting on October 12th this fall. Intrigued?